NOUN: 1a. Belief in and reverence for a supernatural power or powers regarded as creator and governor of the universe. b. A personal or institutionalized system grounded in such belief and worship. 2. The life or condition of a person in a religious order. 3. A set of beliefs, values, and practices based on the teachings of a spiritual leader. 4. A cause, principle, or activity pursued with zeal or conscientious devotion. 1. To become religious or devout. 2. To resolve to end one's immoral behavior. Atheism is the absence of belief in any Gods or spiritual beings. The word Atheism comes from a, meaning without, and theism meaning belief in god or gods. •Atheists don't use God to explain the existence of the universe. •Atheists say that human beings can devise suitable moral codes to live by without the aid of Gods or scriptures. •They find insufficient evidence to support any religion. •They think that religion is nonsensical. •They once had a religion and have lost faith in it. •They live in a non-religious culture. •Religion doesn't seem relevant to their lives. •Religions seem to have done a lot of harm in the world. •The world is such a bad place that there can't be a God. Many atheists are also secularist, and are hostile to any special treatment given to organised religion. It is possible to be both atheist and religious. 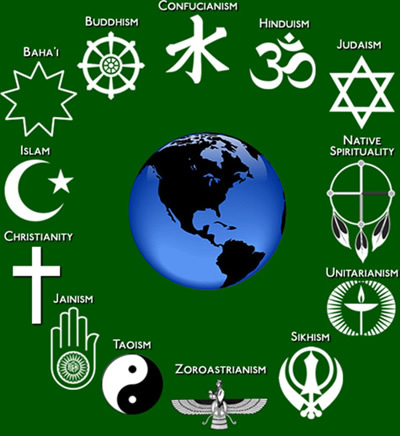 Virtually all Buddhists manage it, as do some adherents of other religions,such as Judaism and Christianity. Buddhism is a spiritual tradition that focuses on personal spiritual development and the attainment of a deep insight into the true nature of life. Buddhism teaches that all life is interconnected, so compassion is natural and important. The path to Enlightenment is through the practice and development of morality, meditation and wisdom. Christianity was founded in the early 1st century AD, with the teaching, miracles, crucifixion and resurrection of Jesus of Nazareth. The central teachings of traditional Christianity are that Jesus is the Son of God, the second person of the Trinity of God the Father, the Son, and the Holy Spirit ; that his life on earth, his crucifixion, resurrection , and ascension into heaven are proof of God's love for humanity and God's forgiveness of human sins; and that by faith in Jesus one may attain salvation and eternal life (see creed ). This teaching is embodied in the Bible , specifically in the New Testament, but Christians accept also the Old Testament as sacred and authoritative Scripture. •Christians believe that Jesus was the Messiah promised in the Old Testament. •Christians believe that Jesus Christ is the Son of God. •Christians believe that God sent his Son to earth to save humanity from the consequences of its sins. •One of the most important concepts in Christianity is that of Jesus giving his life on the Cross (the Crucifixion) and rising from the dead on the third day (the Resurrection). •Their spiritual leaders are called priests or ministers. •The Christian holy book is the Bible, and consists of the Old and New Testaments. Judaism is the "religion, philosophy, and way of life" of the Jewish people. Originating in the Hebrew Bible (also known as the Tanakh) and explored in later texts such as the Talmud, it is considered by Jews to be the expression of the covenantal relationship God developed with the Children of Israel. According to traditional Rabbinic Judaism, God revealed his laws and commandments to Moses on Mount Sinai in the form of both the Written and Oral Torah. •Judaism was founded by Moses, although Jews trace their history back to Abraham. •Jews believe that there is only one God with whom they have a covenant. •In exchange for all the good that God has done for the Jewish people, Jewish people keep God’s laws and try to bring holiness into every aspect of their lives. •Judaism has a rich history of religious text, but the central and most important religious document is the Torah. •Jewish traditional or oral law, the interpretation of the laws of the Torah, is called halakhah. •Spiritual leaders are called Rabbis. •6 million Jews were murdered in the Holocaust in an attempt to wipe out Judaism. There are many people who identify themselves as Jewish without necessarily believing in, or observing, any Jewish law. There are 20 million Sikhs in the world, most of whom live in the Punjab province of India. Sikhism was founded in the 16th century in the Punjab district of what is now India and Pakistan. It was founded by Guru Nanak and is based on his teachings, and those of the 9 Sikh gurus who followed him. The most important thing in Sikhism is the internal religious state of the individual. The tenth Sikh Guru decreed that after his death the spiritual guide of the Sikhs would be the teachings contained in that book, so the Guru Granth Sahib now has the status of a Guru, and Sikhs show it the respect they would give to a human Guru. The community of men and women who have been initiated into the Sikh faith is the Khalsa. The Khalsa celebrated its 300th anniversary in 1999. Guru Gobind Singh decreed that where Sikhs could not find answers in the Guru Granth Sahib, they should decide issues as a community, based on the principles of their scripture. •Hinduism originated around the Indus Valley near the River Indus in modern day Pakistan. •About 80% of the Indian population regard themselves as Hindu. •Most Hindus believe in a Supreme God, whose qualities and forms are represented by the multitude of deities which emanate from him. •Hindus believe that existence is a cycle of birth, death, and rebirth, governed by Karma. •Hindus believe that the soul passes through a cycle of successive lives and its next incarnation is always dependent on how the previous life was lived. •Hindus celebrate many holy days, but the Festival of Lights, Diwali is the best known.